A patient falling is the most common patient safety incident reported to the National Patient Safety Agency (NPSA). 94% of falls in acute hospitals and 88% of falls in community hospitals occur around the in-patient area. a safe height and minimising the risk of falls related injuries. Ultra low height position of only 17cm provides a safe sleeping surface for patients who may be at risk of falling out of bed. Auto contour function allows the backrest and knee break to adjust simultaneously to help reduce shear and friction forces. 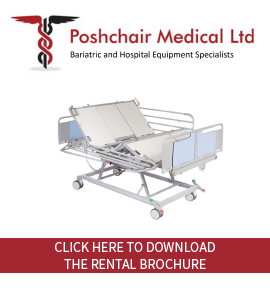 Electric back rest and knee break can be easily adjusted to suit the patient’s individual requirements, increase patient comfort and aid moving and handing procedures. To increase patient independence, the hand set is simple and easy to use, allowing the patient to adjust the position of the bed themselves. Nurse lockout function ensures safe use of the handset and avoids any unauthorised setting changes. Secure central braking system ensures excellent steering and manoeuvrability of the bed. Battery backup is standard to ensure the bed can be lowered in the event of a power failure. Removable ABS mattress platforms allow for easy cleaning to aid disinfection protocols. IP66 ingress protection on all electrical components ensures conformance to disinfection protocols and allows the bed to be easily cleaned.